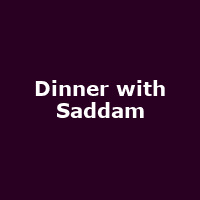 So, what happens when Saddam Hussein turns up on your doorstep and announces he is staying for dinner? The Menier Chocolate Factory will host the world premiere of Anthony Horowitz 's new comedy. Anthony is a hugely successful and prolific writer. He is the author of over 40 books including the best-selling Alex Rider series, the recent Sherlock Holmes novels, The House of Silk and Moriarty and the forthcoming James Bond novel Trigger Mortis. For TV he has written for Midsomer Murders and also created Foyle's War. Lindsay Posner returns to the Chocolate Factory having previously directed Communicating Doors and Abigail's Party. He recently directed the revival of Hay Fever currently running at the Duke of York's." The cast for the Menier Chocolate Factory run features Steven Berkoff, Sanjeev Bhaskar, Ilan Goodman, Rebecca Grant, Nathan Amzi and Shobu Kapoor.